At the outset of our project in early 2008, Madagascar was a thriving democracy with a bustling gold and gemstone industry. 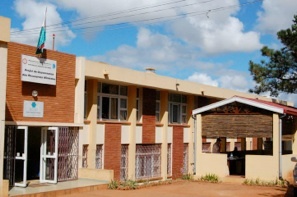 Two gemology schools had been established (IGM in Antananarivo, and ESSVA in Antsirabe) to add value to the supply chain and challenge the paradigm of “Out of the ground, out of the country.” As we were preparing to launch our program, then-president Ravalomanana decreed a ban on rough gem exports, causing a major reversal in mining and trade as international gem buyers fled the country to seek alternative sources. 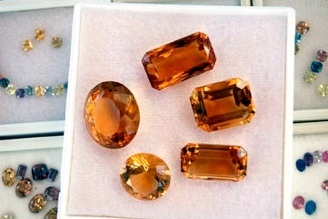 As the global economic crisis unfolded in 2008, the entire jewelry industry was negatively impacted and a sharp reduction in demand for gems from Madagascar accelerated her economic and political troubles. In early 2009, a coup d’etat occurred, and international donors and foreign investment stalled. Widespread travel advisories devastated the tourism industry. In a matter of months, an emerging nation with much promise was effectively isolated from the rest of the world. Throughout these setbacks, The Tiffany & Co. Foundation remained steadfast in its support of our project, and our gratitude for this cannot be properly expressed or exaggerated. We’re also proud to report that despite the aforementioned events, we’ve been able to award 172 scholarships, substantially in excess of our initial projections. Artminers Project Manager Tom Cushman adapted to and expertly navigated every new crisis, and resources are in reserve to award an estimated 15 – 20 additional scholarships after Tom returns to Madagascar in March, 2011. At the beginning of our program, it was anticipated that our cutting and lapidary graduates would find work in local factories, elevating them from poverty to a solid, middle class lifestyle. Unfortunately, anticipated factories never opened while established factories are operating at greatly reduced output. Demand for gemologists and gem cutters is well below anticipated levels. Miss Tahiry graduated from high school but was unable to afford classes at the university. She sought out and was awarded one of our first scholarships for Bijoux Fantasie, and “went entrepreneur,” according to Tom. After graduation, Miss Tahiry started with a card table in front of a large supermarket in Antananarivo, to showcase and sell her creations. By the end of 2010, in addition to her stand at the grocery store, she also started kiosks at the American School Christmas Bazaar, and the Annual Holiday Bazaar at the Convention Center. Her company, Tahiry Vatosoa, has several employees, and she buys merchandise mined and cut by locals, also including some of our grads. 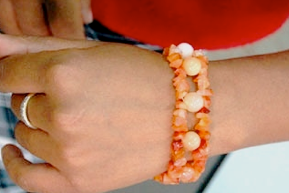 Beyond the successes of Tahiry Vatosoa, a group of seven lapidary graduates have formed a cooperative known as “Art 7 Lapidaire,” where they exhibit at the regular gemstone market and other various shows. 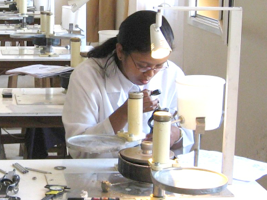 In the traditional gemstone center of Antsirabe, a small, 12-person gem cutting factory called Madacana is operating, managed by an early graduate of IGM. Madacana is staffed by graduates of IGM and ESSVA, several of whom are scholarship recipients from our program. 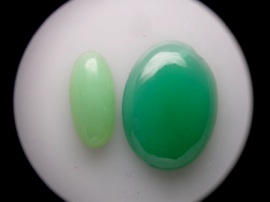 This factory is a joint venture between a Canadian company and a Malagasy entrepreneur, producing high-grade gemstones for export. Replicability for IGM and our program has become evident and Tom has fielded inquiries on setting up similar schools in Zambia and Tanzania. Foreign students attending IGM have come from South Africa, Congo, Tanzania, Mauritius, Nigeria, Burkina Faso, Angola, and Zambia. Official delegations of various foreign ministers have visited IGM to learn more about its model, including the President of Zambia, along with the UN, World Bank and other international donors.